Everyone remembers their first kiss, first time shooting a gun, and the first time driving. For most of us, there were feelings of excitement with trepidation. We either got it right, or used the event as a challenge to overcome. John J. Kennedy’s first release, There and Back, has something memorable and notable, but also something to raise his bar. He will emerge and snowball with time. Remembering our first times produces many emotions. 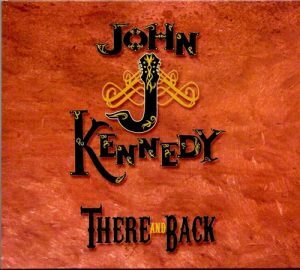 For John J. Kennedy’s There and Back, it should create sentiments of accomplishments. As he develops and evolves, I’ll be interested to hear his future endeavors. He has the makings of a flawless singer/songwriter. I’m J.R. Joseph Miller, and this is John J. Kennedy being There and Back.